IRAQ, a republic in south-west Asia on the Persian Gulf became a British mandate in 1920, until it gained its independence in 1932. In 1958 it became a republic. Land rights in Iraq had evolved over many centuries and incorporated laws of many cultures and countries. Under British Mandate, Iraq’s land was moved from communal land owned by the tribe to tribal sheikhs who agreed to work with the British. Known as compradors, these families controlled much of Iraq’s arable land until the end of British rule in 1958. Throughout the 1920s and 1930s, more and more land began to be amassed in the hands of just a couple of families. By 1958, prior to the revolution, almost one million acres were owned by eight individual families. Prior to the 1958 revolution, more than two-thirds of Iraq’s cultivated land was concentrated in two percent of the holdings, while at the other extreme, 86 percent of the holdings covered less than 10 percent of the cultivated land. Thus, the rise of the new post-revolutionary Iraqi government in 1958 led to the seizure of much of the land, whence landholdings were capped at 600 acres in arable areas and 1 200 acres in areas that had rainfall. The concentrated landholdings by the state were then redistributed among the populace, in amounts of 20 acres in irrigated land, with 40 acres in land with rainfall. During their mandate in Iran, the British had attempted some land reforms in order to increase its productivity. Amongst them was the Pump Law introduced in 1926, which legislated for all newly-irrigated land to be tax-free for four years. This resulted in an increase from one million to 4,25 million acres of land being developed from 1914 to 1943. Land, cultivated for 15 years, became the property of the person who cultivated that land. This led to some short-term gains in land productivity. Aware of the inequalities in the countryside and of the poor condition of most tenant farmers, agrarian reform was high on the agenda for the new government, even though landlords constituted a strong political force, especially during the previous era, and frustrated corrective legislation. Within three months of taking power, a process of land reform was initiated, limiting the maximum amount of land an individual owner could retain. Land holdings above the maximum were expropriated by the government, paying compensation in state bonds, until 1969 when the government absolved itself of all responsibility to recompense landowners. The law provided for the expropriation of 75 percent of all privately-owned arable land. The expropriated land, in parcels of between seven and 15 ha of irrigated land or double that of rainfed land, was distributed to individuals. The recipient was to repay the government over a 20-year period and was required to join a co-operative. Landlords were required to continue the management of the land and to supply customary inputs to maintain production, but reducing their share of the crop considerably. The importance of this provision grew as land became expropriated much more rapidly than it was being distributed. By 1968, 10 years after agrarian reform was instituted, 1,7 million ha had been expropriated, but fewer than 440 000ha of impounded land had been distributed. A total of 645 000ha had been allocated to nearly 55 000 families. Owing to the government’s lack of personnel, funds and expertise to supply credit, seed, pumps and marketing services in the rural areas — functions previously undertaken by landlords — rural-to-urban migration increased as agricultural production stagnated and coincided with a prolonged drought, agricultural production fell steeply in the 1960s. Series of wide-sweeping land reforms were instituted in 1970, while between 1970 and 1982, 264 400 farmers received grants of land. Legislation in 1970 reduced the maximum size of holdings to between 10 and 150ha of irrigated land (depending on the type of land and crop) as well as to between 250 and 500ha of non-irrigated land. Holdings above the maximum were expropriated, with compensation only for actual improvements such as buildings, pumps and trees. 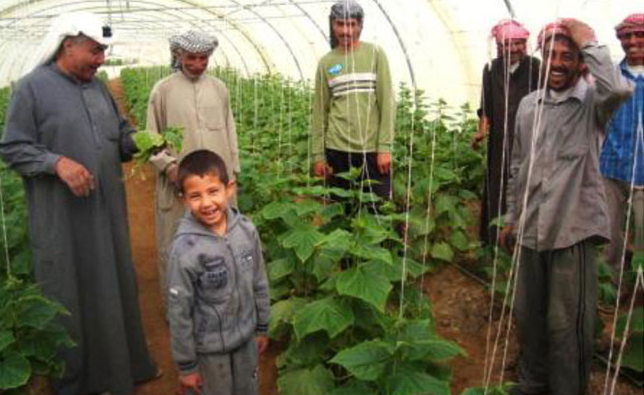 By 1981, Iraq had established 28 collective state farms that employed 1 346 people and cultivated about 180 000ha. In 1983, the government enacted a new law encouraging both local and foreign Arab companies or individuals to lease larger plots of land from the government. By 1984, more than 1 000 leases had been granted. As a further incentive for agricultural productivity, the government instituted a profit-sharing plan at state collective farms. By 1987, the wheel appeared to have turned full circle when the government announced plans to, once again, privatise agricultural production by leasing or selling state farms to the private sector.